Air leaks around the home are the cause of the annoying draughts (drafts), which can create an uncomfortable space in your home. Draughts commonly enter into homes from windows and doors, even when they are closed. These inferior products allow; air, heat, sound, dust and dirt to easily pass inside. This occurs when the window or door does not close or seal properly. The high performing products are air tight and completely draught proof. All Oknalux windows and door products are high quality and high performing. One way this is achieved is by the way the frame seals. Our frames are equipped with rubber seals around the opening portions of the window, ensuring that when the window is closed the sash sits firmly within the frame. This works much like a refrigerator sealing in the cold, and blocking heat from entering. Other window companies use a brush between the frame and the window sash, which stops some dirt but doesn’t create a sealed system and allows air to pass through. 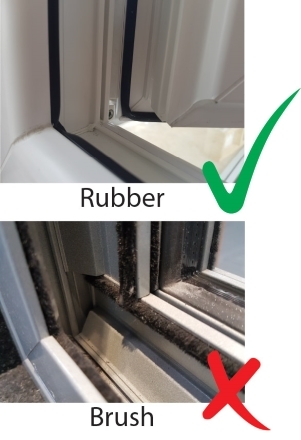 Rubber seals are essential to prevent air flow, but it also has two other great benefits too. Firstly, it will reduce outside noise. It prevents sound from travelling through the small gaps, which act as the path of least resistance. Secondly, it will increase the energy-efficiency of your windows and doors, by stopping heat loss or heat gain. This can amount to thousands of dollars saved on electricity bills. When considering double glazing, many people believe the glass selection is the only factor in performance. We would argue that a high performing frame and sealing system is just as important as the glazing unit. There is no point spending money on a double glazed system, if heat, sound and dirt, is going to travel right through and into your house. When considering purchasing windows and doors, whether it be single glazed or double glazed, it is essential to block these draughts from entering your home. This will stop the howling and rattling on the windy days, block any street noise, create a more comfortable environment inside, and even save you money.